Saratoga.com - Mannix Marketing, Inc.
Saratoga.com is a popular year-round website used by both visitors and locals, steadily driving nearly 500,000 views per month, with a social media following nearing 100,000 fans and a newsletter readership over 20,000. If you target the diverse Saratoga market, you know how important it is to build relationships with your customers. 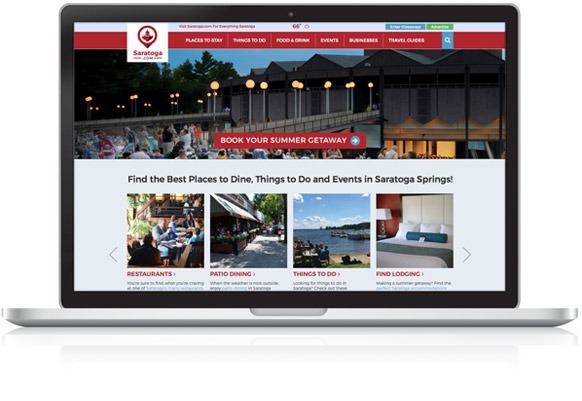 Saratoga.com and its talented team of marketing specialists have built a nationally recognized brand around relevant, targeted online relationships with vacationers and locals alike. And we can help you build a custom, results-oriented campaign for your business. Ready to start? Choose from packages that include customized listings, images, video, display ads, specials, coupons and more. Target an ideal demographic that continues to grow as we work to build and expand the visitor base; site visitors are college-educated, 35 and older with incomes well over 60K.